If you’re reading this post from your desk located in 200 West Street, I imagine the atmosphere is pretty awkward right about now. But for those situated elsewhere, welcome to the Schadenfreude event of the year. 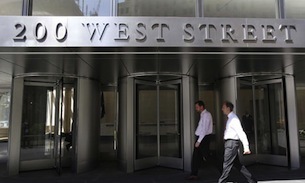 200 West Street, also the location for the Goldman Sachs New York branch was–let’s spare the niceties–eviscerated in a New York Times Op-Ed this morning titled Why I Am Leaving Goldman Sachs. The article, written by Greg Smith, is one of the bravest pieces of journalism I’ve read outside of war journalism. Although the financial institution does have the common attribute of leaving people for dead, albeit financially. Now, there’s no question in my mind that the self-interested sharp-toothed suits will come out of the woodwork and damn Smith for the unrepairable damage he has done to Goldman Sachs, but if it’s any consolation to the former executive director, I consider him a hero on so many levels (as I’m sure many out there will). Corporate culture has undoubtedly changed over the last decade with more of an emphasis on the fast bottom line, as opposed to developing long term relationships. And sure, many will retort with the knee-jerk “that’s corporate America for you!” but the ruthless way of doing business, which Smith describes as, “too much about shortcuts and not enough about achievement” is a terminal cancer on our way of life, as business men, as human being, as Americans. I think the larger issue here, which Smith inadvertently raises, is how do those of us with moral code and a humanistic approach to the day-to-day approach the corporate world? It’s pretty tough, I tell you. As a full time advertising creative, I am only asking this in light of New York ad agency BBH Lab’s recent Homeless Hotspots project which paid homeless people at the SXSW Festival to operate as a fully functioning and walking wireless 4G hotspot. Now, many of my peers have no problem with this. In fact, most of them thought it was a great idea (some, problematically, thought it was funny). But like Smith, I find this disregard for humanity weirdly discomforting. The goal, as I see it, ultimately, is “too much about shortcuts and not enough about achievement.” Emma Cookson, chairwoman of BBH New York, cites the Homeless Hotspot project as “a big success just in terms of getting attention for the issue and getting debate going.” Fine. I’ll swallow that pill for a second. BBH wanted to get attention for the homeless problem, and not for their agency. This wasn’t an instance of courting controversy for the sake of an award season case study. This was altruism at play. Turning people into Internet routers amidst the chaos of SXSW interactive is sadly not empowering in the least. It’s black-and-white demeaning. BBH says, though, we’re paying them a daily fee. The debate online is whether the volunteers are being paid $20 a day, or $50. But whatever it is, $80, or even $200, over the span of four days, will not buy a home. BBH says that festival attendees should donate the Homeless Hotspot for wireless usage. Imagine the awkwardness involved in paying someone with no home and no job, who is also relegated to wearing an “I’m a Hotspot” T-shirt, a few dollars for the menial task of updating your Facebook page. It’s a surreal prospect to me, and one that almost feels cruel. And of all the articles I’ve read of the project, of which, to BBH’s self-determined success, there have been many, no one at the agency has even addressed how some would see that there is a problem with reducing the dignity of people who already have very little. Where’s our moral compass, Greg Smith asked us? Not to just those employees at Goldman Sachs, but I’d like to think he was talking to all of us. Puhlease. Let’s not make the first Jewish (or maccabiah bronze medalist) martyr yet. Pardon the cynicism, but when I read his nobel peace prize speech, what I hear is some guy who has decided to launder his guilt in public AFTER cleaning house at Goldman Sax company for 12 years, conveniently giving himself both an excused absence AND a leg up with getting clients in case he wanted to open his own shop. No mistake: this column was enlightening and damning, confirming what most of us assumed, and I think it’s important enough to even possibly be a tipping point in regulation of capital markets. But let’s not create a moral scale so low that we celebrate a multi-millioner who comes clean after the stakes of doing so just aren’t that high as some kind of an ethical transcendence. One of the my favorite attributes of God is forgiveness. I think, whatever presumptions you’re making about Smith’s business practices, everything is forgiven. Especially after a piece like this. Does it strike anyone as insane that this young man with TWELVE years of experience was managing over a trillion dollars in assets? As Mr. Smith details in the article, he could not tie his shoes or find the bathroom when he first arrived at Goldman Sachs. Are these finanical instruments just arcane games rigged to f-over the regular schmuck? If I am a business or a fund, I am not entrusting my money with a 20 or 30 year old with little to no experience, unless I know the fix is in. This is crazy.